Desktop Linux is DEAD? We debunk this craziness! Plus our review of Trisquel GNU/Linux, a beautiful distribution that respects your freedom. But does it make a compelling desktop? Tune in to find out! 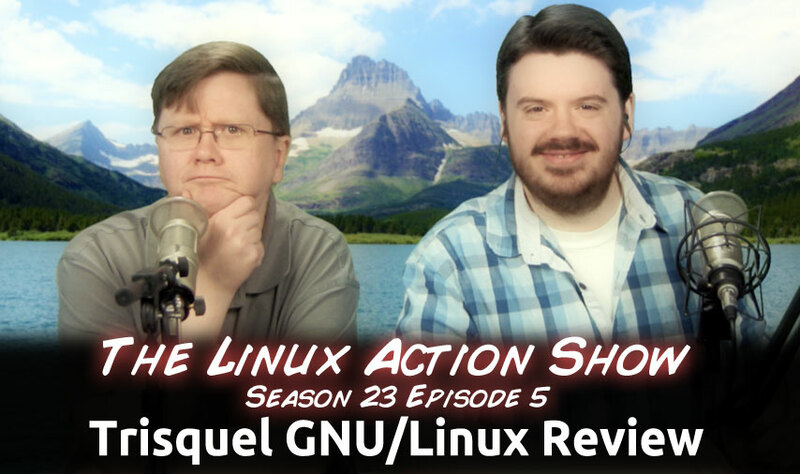 All this week on, The Linux Action Show! Missed the good deal? Use our code LINUX and save 10%! anytime! Contribute directly on our donation page or check out our advertising options and reach millions of amazing people! Grab our Chrome Extension and auto-tag your shopping session for us! Android Picks so far thanks to Madjo in the IRC Chat room! TurnKey Linux Virtual Appliance Library: 100+ free ready-to-use applications for virtual machines, the cloud, and bare metal. Valve’s release of GreenLight has a chance to make Steam for Ubuntu (and soon others) successful. There’s gonna be a lot more than L4D2 if everyone shares this page. Thanks to Mr_Gentoo in the Subreddit! Free and open source software takes precedence. By law! Open webOS 1.0 Beta Released! openSUSE 12.2 Review Next Week! Public presentation of Trisquel GNU/Linux! The 5.5 STS edition, codename Brigantia, was released on April 16, 2012. Brigantia is an STS (short term support) version, which will be supported for one year after release. Very elegant reintroduction to the LXDE desktop. Ubuntu Updater, use PPAs, Ubuntu underpinnings… But Ubuntu never gives back? Which version of Ubuntu is trisquel based off of? | Trisquel GNU/Linux – Run free! How much does Trisquel benefit from being a Ubuntu based distro? | Trisquel GNU/Linux – Run free! Why not Debian? Debian doesn’t use FSF definition for free software, but its own instead. Ubuntu’s main and universe repositories contain only free software as defined by FSF (but some packages require cleaning up so they don’t recommend non-free software). Trisquel GNU/Linux does not have 100 associate members | Trisquel GNU/Linux – Run free! Associate membership program | Trisquel GNU/Linux – Run free! Crowd funded tasks | Trisquel GNU/Linux – Run free! A great distro, that is pleasant to use, and easy on the eyes with smart choices made. However, it does feel a bit heavy with its message if a few spots (might be off putting to some switchers) and with it’s probable GNU/Power user target demographic, perhaps being based on Arch might draw more interest. As you can see in the video I recorded during my testing, the hardware support is fantastic and mirrors Ubuntu proper. That said, Gnash is painful to use and the firmware restrictions did affect the abilities of some wireless devices. This distro is otherwise, no different that Ubuntu, from which it is based on. As for seeking help in their forums, be prepared for attack of the RMS clones when asking ANYTHING to do with proprietary options such as firmware, etc. . If I was a new user, I’d be looking elsewhere. For myself, I am keeping it on an old mini-tower running LXDE. What’s the best way to stream LAS w/o web browser? I would like an good old fashion review of PC-BSD 9.1 on LAS.